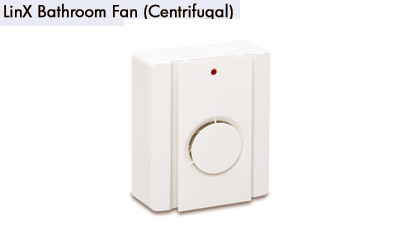 The LinB range of centrifugal bathroom fans are designed for ducted ventilation of internal bathrooms and toilets. LinB is designed for surface or flush mounting due to the cassette design of the motor and impeller assembly. The rear spigot can be mounted in 2 positions allowing for rear exit or connecting to a vertical ducted system. Designed for wall or ceilings mounting and discharging via rigid, flexible or flat ducting. Available as a wall model with the addition of a wall fitting kit. Single speed fan with integral backdraught shutter. Meets the requirements of Part F Building Regulations 2006, for installed performance. Single speed fan with integral backdraught shutter. Integral adjustable, 1 – 20 minutes, electronic overrun timer. Meets the requirements of Part F Building Regulations 2006, for installed performance.